Black Hawk is getting a new owner. Lockheed Martin is buying Sikorsky from United Technologies. The famous Black Hawk and Marine One helicopters will soon have a new owner. United Technologies agreed to sell its Sikorsky chopper unit to rival defense company Lockheed Martin for $9 billion on Monday. United Technologies (UTX) put Sikorsky on the shopping block last month. Lockheed Martin (LMT) was reported to be one of the potential suitors. Sikorsky has been making helicopters for the White House since 1958. It won a $1.24 billion contract last year from the U.S. Navy to build six new helicopters by 2020 and will eventually make a total of 21 helicopters by 2023 to replace the current Marine One fleet. 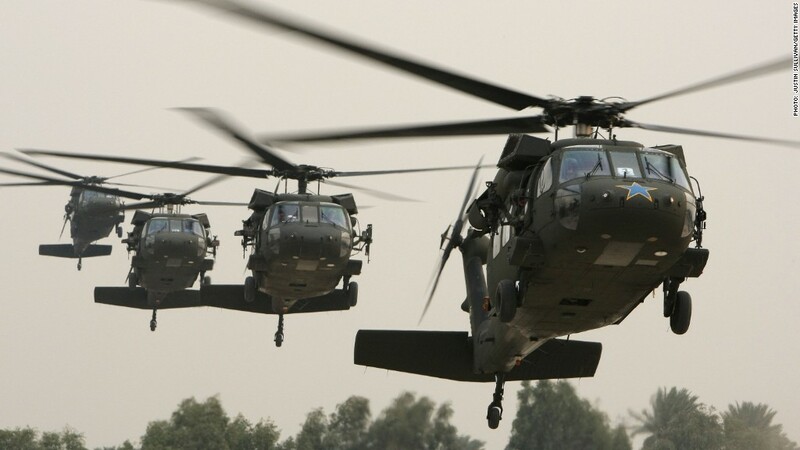 The Black Hawk is probably most famous for its use by United States forces in Somalia in 1993. Eighteen American soldiers were killed after two helicopters were shot down in the October 1993 Battle of Mogadishu. The events were the basis for the book and movie "Black Hawk Down." Sikorsky, which began making aircraft 90 years ago, has been part of United Technologies since 1929. But Sikorsky, which accounted for nearly 10% of the total sales at United Technologies in the first quarter, is not very profitable. United Technologies CEO Gregory Hayes said in a statement Monday that selling Sikorsky will allow the company to focus more on other high-tech parts of the defense industry. United Technologies also owns the Pratt & Whitney jet engine business, as well as the Otis brand of elevators and Carrier line of air conditioners. Still, the Black Hawk is still one of the top helicopters purchased by the federal government. According to budgets from the Department of Defense, the U.S. military has requested $1.6 billion to buy 94 UH-60 Black Hawks in fiscal 2016. The Pentagon bought 70 Black Hawks in fiscal 2014 and 86 in fiscal 2015 for a combined total of $2.8 billion. "Sikorsky is a natural fit for Lockheed Martin and complements our broad portfolio of world-class aerospace and defense products and technologies," said Marillyn Hewson, Lockheed Martin chairman and CEO in a statement. The deal is expected to close later this year or in early 2016. Shares of Lockheed Martin, which also reported strong earnings on Monday morning and possible plans to sell or spin off some of its technical services business, rose more than 1% in early trading. United Technologies was up 1% as well. It will report its latest earnings on Tuesday.